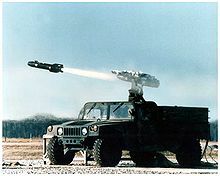 The Hellfire II, developed in the early 1990s is a modular missile system with several variants. 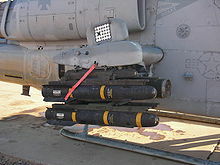 Hellfire II's semi-active laser variants—AGM-114K high-explosive anti-tank (HEAT), AGM-114KII with external blast fragmentation sleeve, AGM-114M (blast fragmentation), and AGM-114N metal augmented charge (MAC)—achieve pinpoint accuracy by homing in on a reflected laser beam aimed at the target. Predator and Reaper UCAVs carry the Hellfire II, but the most common platform is the AH-64 Apache helicopter gunship, which can carry up to 16 of the missiles at once. 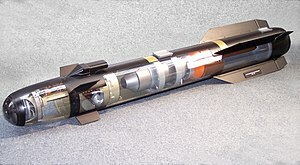 The AGM-114L, or Longbow Hellfire, is a fire-and-forget weapon: equipped with a millimeter wave (MMW) radar seeker, it requires no further guidance after launch—even being able to lock-on to its target after launch—and can hit its target without the launcher or other friendly unit being in line of sight of the target. It also works in adverse weather and battlefield obscurants, such as smoke and fog which can mask the position of a target or prevent a designating laser from forming a detectable reflection. Each Hellfire weighs 104 pounds (47 kg), including the 20 pounds (9 kg) warhead, and has a range of 26,000 feet (8,000 m). ^ Klapper, Bradley (February 13, 2016). 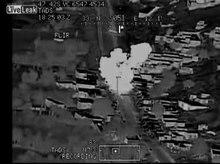 "Cuba Returns Dummy Hellfire Missile Mistakenly Received". ABC News. Archived from the original on February 13, 2016. Retrieved October 1, 2017. ^ Ahronheim, Anna (November 30, 2016). "ISRAEL NAVY DEBUTS NEW SUPER DVORA PATROL CRAFT". The Jerusalem Post. Retrieved October 1, 2017. 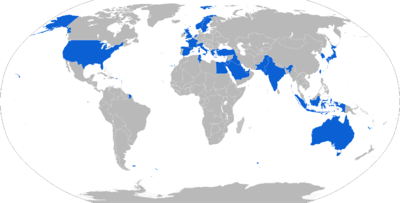 This page was last edited on 18 March 2019, at 00:42 (UTC).